How to make sense of the Tabernacle requirements at the end of Exodus? Let them construct a sanctuary for Me, that I may dwell among them (Ex 25:8). In reading through the Pentateuch toward the end of Exodus, there are chapters and chapters that contain only the requirements and details concerning the content and dimension of the tabernacle. This is not exactly devotional reading. I admit that at times I have to devote much energy to just getting through some of this seemingly minute and needless material. So, how do we account for this material? What insight could possibly come from such passages? 1. The LORD, the one who covenants with Israel: In the Pentateuch, we see the LORD covenanting with his people. The LORD is good. His stipulations for covenanting with his people are also good. Regardless of how tedious the temple requirements are, it does not change the ineffable fact that the maker of heaven and earth is making a way for his people that he created to commune with him. When the LORD gives his purpose for establishing a tabernacle, it is "that I may dwell among them" (Ex 25:8). When you gaze upon the tabernacle requirements in the book of Exodus, know that you are gazing upon the undeserved grace of the LORD. 2. Moses, the worship leader of Israel: When I was reading through the Pentateuch, I was really struggling to see the need for such tedium. Do we really need to know how long the curtains were, and what kind of stones were used, and what worker #206 ate for breakfast the day before they left Egypt? As I was attempting to find some nugget of insight in these passages, I noticed something that instantly change my perspective on this alleged tedium. After Moses comes down the mountain with the instructions from the LORD, he says to the people, "These are the things that the LORD has commanded you to do" (Ex 35:1). A striking refrain throughout the rest of the tabernacle narratives is that a certain thing was done "just as the LORD had commanded Moses" (Ex 39:5). Over and over this phrase occurs. Whenever stones are made, whenever priestly garments are sewn together, whenever the courts were set up, it was done "just as the LORD had commanded Moses" (e.g., 39:1, 5, 7, 21, 26, 31, etc). Throughout the Old Testament, a leader or a King is evaluated according to how he treats and maintains the house of the LORD (tabernacle or temple). If he neglects the tabernacle or temple, he is a bad leader. If he is concerned with the house of God, he is a good leader. When Moses leads the people of Israel in the construction of the tabernacle, he leads them in worship! The tabernacle was not hastily thrown together. Rather, much care and effort went into getting the measurements and dimensions "just right." Concern for the tabernacle equals concern for the God who would one day fill that tabernacle with his glory. What's more, this building was Spirit-led. The men working on the tabernacle were selected because they were skillful, but Moses tells us that it was the LORD who put that skill and understanding in their hearts (36:1-2). The congregation of Israel supplied the materials for the tabernacle, but Moses tells us that "everyone whose heart stirred him and everyone whose spirit moved him" came and contributed to the building project. The response was so overwhelming that Moses had to command the people to stop giving because "the people [were] bringing much more than enough for the construction work which the LORD commanded" (36:5). The entire nation was involved in this building project. The worship service began before the tabernacle was even constructed. The requirements were met before they even had a chance to pass the offering plate! Here we find that the LORD commanded the building of the tabernacle; the LORD created the ability to carry out this command in their hearts; and the LORD prompted the people to give the required materials. This is the LORD's work through and through. What the LORD had commanded Moses, the people did. As you read through these narratives, when you come across temple requirements given and met, you have come across worship of a living God by a people solely dependent upon him. 3. The Tabernacle, the place where his glory dwelt: What is the result of this obedience? "Moses examined all the work and behold, they had done it just as the Lord had commanded" (39:43). 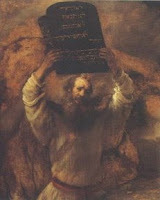 At the end of the book, "Thus Moses finished the work" (40:33). The result? "Then the cloud covered the tent of meeting, and the glory of the LORD filled the tabernacle" (40:34). This glory was so thick that "Moses was not able to enter the tent of meeting." The cloud had settled and the glory of the LORD had filled the tabernacle. The rest of Israel's history is marked by the presence of the LORD in the place that he had prepared. This is what set them apart from the other nations. God was with them. Far from being a tedious appendix to the book, the tabernacle requirements and construction are the climax of the book of Exodus. The LORD commands, the people execute accordingly, and the Glory of the LORD fills the tabernacle. Look to these narratives and be amazed: The LORD dwells with his obedient people! This picture of worship looks forward to the time when nations from every tribe, tongue and nation will come to the house of the LORD to worship and obey. May the tabernacle narratives quicken in us a longing for that day. There are many more stipulations and requirements in the rest of the Pentateuch (i.e., Leviticus!) and the OT (regarding the temple) concerning the house of the LORD. I think it is possible to read those further stipulations and requirements throughout the rest of the canon in light of what is emphasized in these final Exodus passages. When viewed canonically, these instructions are an occasion for the people to worship and obey, and for the LORD to display his glory.